British milk. Billions of live cultures. Natural ingredients. Source of protein, calcium and vitamins B2 and B12. Sugars only from milk, fruit 'n' honey. Gluten free. Suitable for vegetarians. Kefir (said keh-fear) has been enjoyed around the world for over two thousand years. 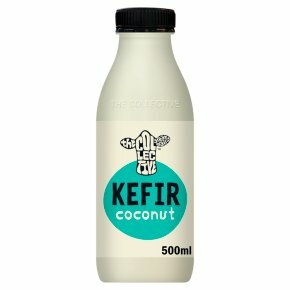 This wonder drink is made by fermenting milk with live cultures, much like a traditional yoghurt... but what sets kefir apart is the diverse blend 'n' number of live cultures, in fact ours boasts a whopping 13 different strains! Nutritious and mighty tasty too, our smooth 'n' silky kefir will tingle your tongue with its natural effervescence. The ultimate snack, perfect brekkie or great to liven up a smoothie or bowl of cereal. Go with your gut... give it a glug! Shake well before opening and enjoy within 2 days.